video screenshot © Brent Rowlandâ¨. A classical ballet performance is more than just a perfectly executed choreography: the fantastical stories told through the great ballets of the 19th and 20th century also call for impressive sets and props, a powerful orchestra, not to mention well-crafted costumes. Perhaps the best known garment in the world of ballet, the tutu was first invented in the early 20th century as a way to fully expose ballerinas’ legs, thus allowing them to demonstrate their advanced technique and strength. With its construction involving as many as 16 layers of tulle and other materials and its own set of interesting design secrets, it isn’t surprising that only an expert ballet-costume maker really knows how to make them. David Heuvel, the Costume Production Director at Salt Lake City’s Ballet West in Utah, USA, is one such expert: working as a ballet costume designer for over 25 years, he has created hundreds of beautiful ballet costumes by hand, having fitted embroidery and tulle on the slender figures of legends such as Margot Fonteyn, Natalia Makarova and other international ballet stars. 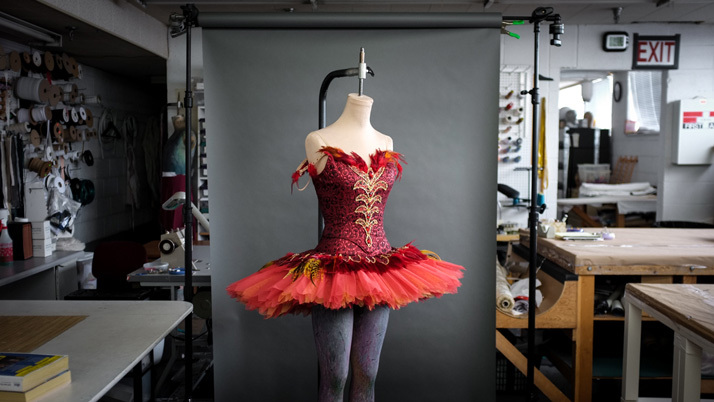 Salt Lake-based photographer and filmmaker Brent Rowland was allowed into Heuvel’s workshop, and has produced a short documentary about the making of the costumes for a Ballet West production of Stravinsky’s ‘The Firebird’. The film follows the process of making the Firebird tutu from conception to the final result, and was published on VideoWest, an online platform for short film creators based in Utah, USA.